Need a nap after your holiday feast? Don’t blame the turkey! Simply Put: NO! there is not enough tryptophan in a serving of turkey to make you drowsy. Have you ever felt drowsy after a meal, especially a holiday feast? Don’t blame the turkey! Urban legend tells the tale that the sleepiness you feel after a holiday meal is due to the tryptophan in turkey. But, I’m here with some good news for turkey lovers: that’s a myth! Turkey alone doesn’t make you sleepy. Tryptophan is an amino acid found in small amounts in all protein foods, like turkey, milk and eggs. 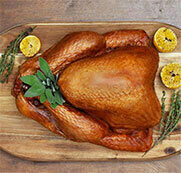 Turkey contains the same amount of tryptophan as other meats. The amount of tryptophan in a serving of turkey (or other meats) isn’t enough to make you drowsy. What’s the real culprit for that post-meal drowsiness? It’s more than likely due to over eating, too many carbohydrates (stuffing, mashed potatoes) and enjoying a few alcoholic beverages. Plus, holidays are a busy time of year. Good to Know: Turkey is a holiday nutritional super star; it combines a whole lot of nutritional value for fewer calories and less fat than some other holiday choices such as prime rib or glazed holiday ham. A simple way to help you eat enough to be satisfied and not stuffed: use smaller plates. That way, you can get all the great tastes you love in portions that won’t push you over the fullness edge. Eat slowly and savour every bite. Good to Know: A serving of turkey according to Eating Well with Canada’s Food Guide is 75 grams. That’s about the size of a deck of cards. Choose lean protein (hello turkey!) for long lasting energy. A serving of lean turkey provides quality protein to keep you feeling satisfied and energized. Yes, turkey is lean! Even the dark turkey meat is lean, and it’s also a source of iron*, which helps deliver oxygen through your body to your muscles and brain so you feel energized. Lighten up your plate with nutrient-rich choices (yes, we’re talking turkey!). Fill half your holiday plate with vegetables – luckily, turkey pairs perfectly with any vegetable you like! Go light on creamy sauces and gravy – use enough for great taste without drowning your food. Switch up your stuffing. Skip the white bread stuffing. There are so many better-for-you choices! Check out this stuffing with wild rice, chickpeas and dried cherries. It is definitely going to accompany the roast turkey on my holiday table this year! Drinking plenty of (non-alcoholic) fluids, like water and sparkling water, can help you to stay hydrated and feel alert. I always have bottles of sparkling water on my holiday table. Think water is ho-hum? Make it festive by adding fresh cranberries and mint leaves.